The great cooperation between the two great nations of China and India will create global influence, President Xi Jinping said on Friday. Xi made the remark while meeting with Indian Prime Minister Narendra Modi, who is holding a two-day informal meeting with Xi in Wuhan, the capital of Central China’s Hubei province. 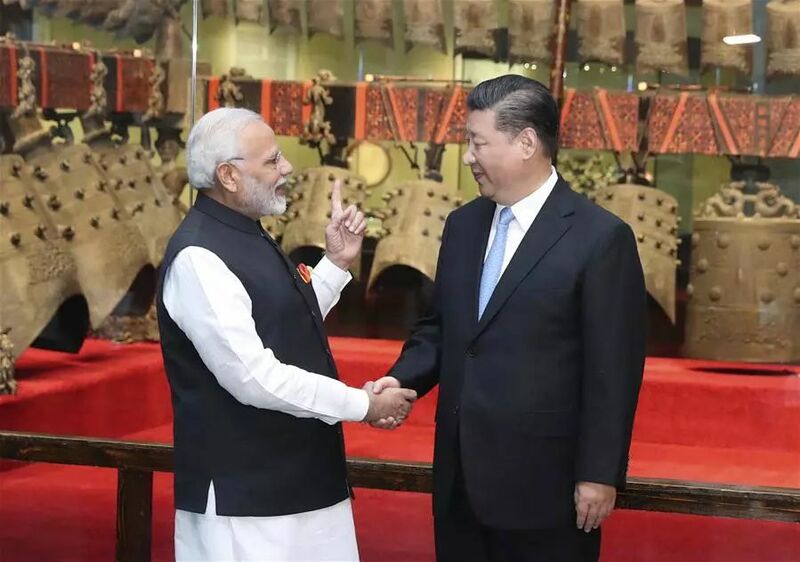 Noting that he and Modi have visited each other’s country and held talks many times on multilateral occasions in the past three years, Xi said that the two leaders have built good working relations. The consensuses reached by the two sides have provided positive signals of China-India friendship and reflected the strong will of China and India — as two big emerging economies — to enhance mutually beneficial cooperation, Xi said. The president said he hoped this meeting could unveil a new chapter for China-India relations. Xi called on the two sides to guide China-India relations from a strategic view and ensure that the bilateral ties will progress in the right direction. The China-India relationship should be enhanced continuously, and it should be like the Yangtze and Ganges rivers, which never stop flowing and always move forward, Xi said. China would like to make joint efforts with India to build a closer development partnership and promote cooperation in all areas, Xi added. Modi expressed gratitude for Xi’s invitation to attend the informal meeting, saying the meeting has historical significance. The frequent high-level exchanges and strategic communication between India and China can boost mutual understanding and enhance cooperation, which will benefit both sides as well as the region, Modi said. The two leaders viewed an exhibition featuring fine relics of Chinese civilization at the Hubei Provincial Museum on Friday afternoon. They also exchanged views on the exchanges and communications between the two ancient civilizations of China and India, and on promoting the harmonious co-existence of different civilizations. Both China and India have a glorious history and culture, and the cultures of both countries have lots of connections, Xi said, adding that the two countries should expand communication and be dedicated to the revitalization of Oriental civilization. Modi said both India and China are ancient civilizations, and the histories of the two countries have many similarities. The two countries should boost mutual understanding and jointly deal with global problems and challenges, he said. The meeting between Xi and Modi will promote free trade, strengthen unity among developing countries and uphold the principles of equity and justice, said Chinese Ambassador to India Luo Zhaohui. People-to-people exchanges­ between China and India exceeded 1 million last year. Over 20,000 Indians study in China, and 42 flights operate between the two countries each week, according to statistics from the Foreign Ministry.